In 1992, knowqing of my interest in all matters anomalous, the late Chic Duthie, at that time Stirling Castle's senior Warden (or 'Blue Coat', as that great building's guides are affectionately known) - alerted me to an odd object, recently put on display within the Regimental Museum of the Argyll and Sutherland Highlanders. It was a small black and white photograph, taken in the 1930s - I was told - by an architect friend of then Castle Governor, Lt General Sir Humphrey Gale. It is a study of the Upper Close, the archway linking the 16th-Century Royal Apartment Buildings with the Great Hall, completed by James VI - the image dominated by what appears to be the shadow of a kilted figure striding through the archway. Amused but unconcerned, and no believer in ghosts, the unnamed photographer is said to have gifted the image to Sir Humphrey. According to that distinguished soldier, his friend had risen early in order to avoid the interruptions of life within what was, at that time, still an active garrison. The Close provided passage between the barracks and Staff Sergeant's quarters and the Upper Square where daily drill would shortly commence. He could recall no-one passing him as he worked, and had been surprised by the 'kilted shadow'. The image does not appear to be a double-exposure - if it were then even the most fractional movement between shots would have resulted in tell-tale blurring of the surrounding stonework. I'm assured by a photographer friend that the camera itself was fairly sophisticated, as indicated by the simple fact that there is no evidence of the verticals converging (as would be the case with simpler cameras). While the photograph itself has been subject to scrutiny many times over the past eighty years, the plate or negative - like the name of the photographer - has remained undetective. The photograph passed into the hands of Barrister Reggie Bell, and was gifted to the Argyll's Museum in 1922 by his cousin, Reggie MacLeod, who was convinced of its authenticity. It must be remembered that the photograph's first named owner, Sir Humphrey Gale, was a notorious practical joker, so it is entirely possible that the lack of provenance for the photo's origins may be more than just a coincidence. 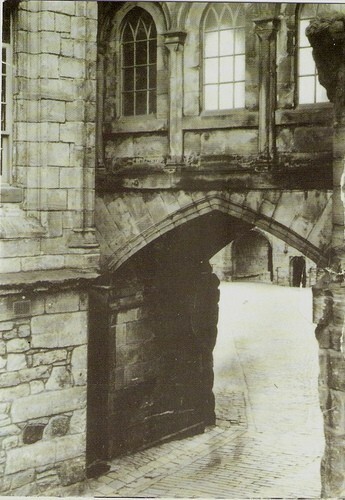 The architect's tale is first told by the Lt General in the early 1950s, shortly after two soldiers on Night Watch reported seeing a kilted figure in an unfamiliar uniform on the stretch of battlement connecting the Douglas Garden and King's Old Building...a walkway reconstructed after a devastating fire there in 1855. According to Chic Duthie, the most likely candidate for the identity of this figure - and the shadowt figure in the photograph - was Gunner Charles Haimes, who perished preventing that inferno spreading from the Officers' Mess to the nearby Gunpowder Store. Haimes, he told me, was still watching over the Castle each night, down through the ages. A nice tale, but Chic did have a wicked sense of humour...rather like Sir Humphrey Gale, in fact.